A lot of testing, thought and labour has been put into building the Tommaso Bestia cyclocross bike and its big brother Tommaso Diavolo. The Tommaso product team raced rode and tested this bike first hand and made umpteen design changes and refinements in order to bring the bike to the state that it is in today. All this work pays off when you see this bike hit the roads. Tommaso Bestia sets the roads ablaze with its Shimano components, dependable Alex rims, stiff FSA crankset and Tommaso TRS Handlebar. This bike comes with the assurance of miles of dependability and supreme ride experience quality irrespective of whether you are using it for commuting, exercising or racing. Standard geometry and detailed tubing lengths per frame have been used to build this bike. This bike is meant for one thing – speed and if you are looking for a high-performance bicycle for turning up the heat and get into the next level with biking, this one is the perfect choice. The Tommaso Bestia Cycocross Road Bike is equipped with Tommaso Ultra Light 6061 Aluminium Road Frame; Tommaso Ultralight Aluminum Fork; Threadless Headset (Integrated); Shimano Tiagra 2×10 Shifters; KMC DX10 Chain; Tektro CRV520 Brakes; Shimano Tiagra Derailleurs; Alex R450 Wheelset; Kenda K-162 Tires (700x35C); FSA Vero 50-34T Crankset; Shimano Tiagra 11-25T Cassette (10 speed); Tommaso Alu Ultralight Race Series Handlebar; Tommaso Alu Ultralight Race Series Seatpost and Tommaso Alu Ultralight Race Series Saddle. The Tommaso Bestia is an intermediate level bicycle which aims to take your biking to the next level. The bike comes with an aluminium frameset and Shimano components, this bike is capable of clocking fairly high speeds. Every part of this bike has been carefully tested and judiciously chosen with the aim to make the bike as light, nimble and fast as possible. The ride experience offered by this bike is supreme and the bike is quite fast and agile. The Shimano Tiagra shifters live up to their reputation and allow for seamless and efficient shifting. The Tektro CRV520 brakes provide shear braking force with high precision and control. All this technology has been put into motion by FSA compact Tempo crank. The FSA crank provides a user friendly gear ratio which enables the riders to face any kind of surface with east and grace. Overall, this bike packs in a power-puffed performance along with a complete package of speed, agility, control and comfort. The price of the bike makes it quite a bargain looking at the set of components and the range of features available. 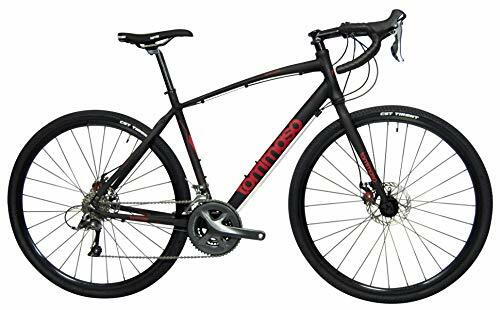 This bike is meant for racing but can also serve as an efficient and reliable commuter and if you’re looking for either one of those or both, this bike is definitely recommended.